Luckily, we live in what I’ve learned by first-hand experiences is one of the world’s foodie capitals - Melbourne. 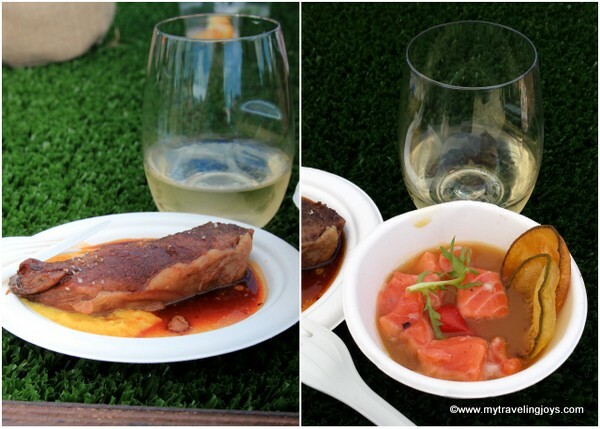 Yesterday, we attended the 11th annual Taste of Melbourne, a foodie festival that featured more than 50 tasting dishes from Melbourne and Victorian region chefs as well as local wines and distilled liqueurs. This festival, held at the scenic Albert Park Lake, made me fall in love with this city’s thriving culinary scene all over again. 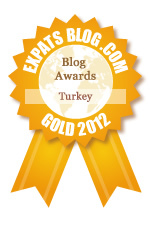 Life as an expat isn’t always easy, but when events like this happen, I remember why we moved abroad in the first place. 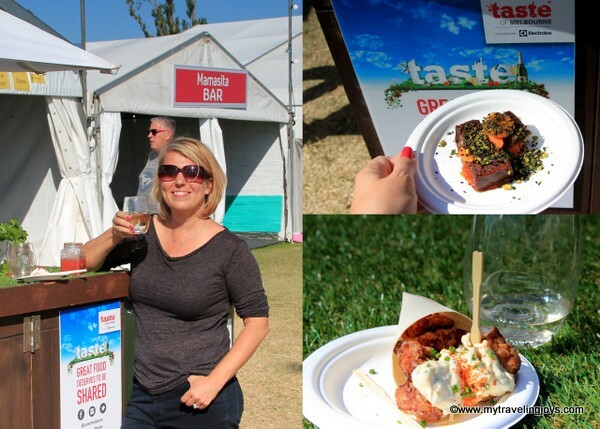 So here’s a foodie recap of the delicious dishes and new-to-us restaurants we tried at the 2015 Taste of Melbourne festival. We started out with a plate of four spicy prawn and chicken dumplings by highly acclaimed chef Andrew McConnell at Supernormal, a 1 Chef's Hat restaurant located in the CBD. 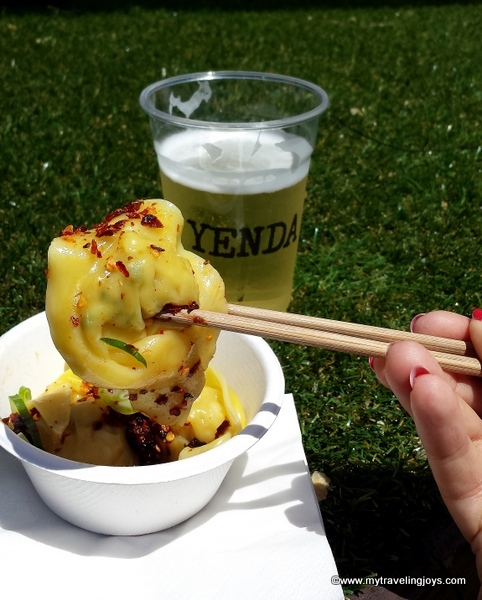 A dry apple cider by Yenda Beer paired well with the peppery Asian food. We shared a skewer of Moorish-spiced, charcoal-grilled lamb by MoVida, a popular Spanish tapas bar. We sampled two dishes from Peruvian native Alejandro, chef at the new Pastuso, which included: salmon ceviche with plantain chips and 8-hour, slow-cooked beef ribs with sweet corn puree. The tantalizing ribs simply melted in our mouths! In between eating, we also sipped on some fresh, vibrant New Zealand wines by Oyster Bay and Villa Maria. Since moving to Australia, I’ve fallen in love with the N.Z. wines from the Marlborough region, which we plan on visiting in December. I cannot wait! 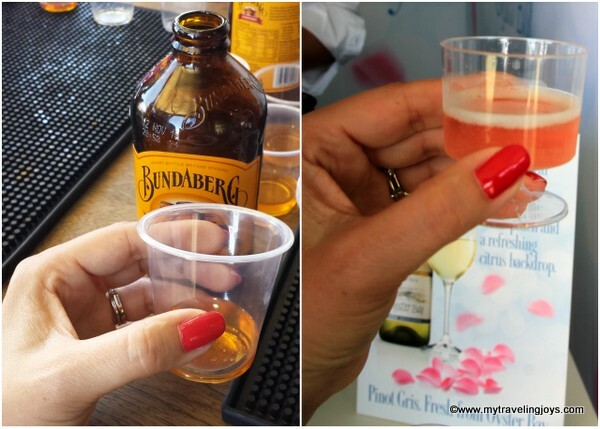 We also attended a free rum tasting by Bundaberg, a family-owned business since 1960. We love this Aussie company’s brewed ginger beer, and now we need to look out for its rum! Hubby tried some local vodkas and gins as well. One of my favorite dishes was a crispy soft-shell crab souvlakakia with mint and coriander by Gazi, a Greek restaurant in Melbourne’s CBD by MasterChef judge and foodie celebrity, George Calombaris. Another culinary delight was the crunchy chicken “nuggets” with a 7-spice Japanese tartare sauce by Sake Restaurant (bottom right photo). 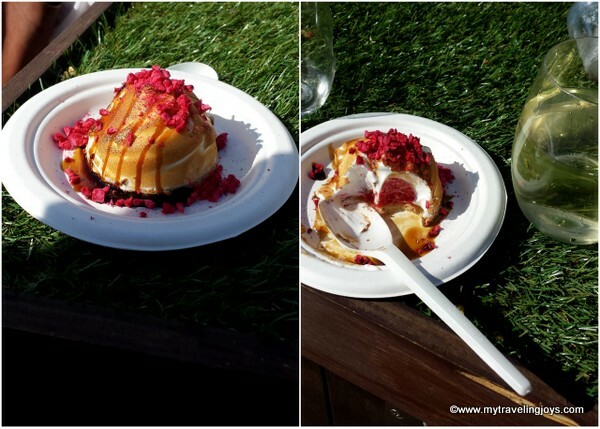 This Japanese eatery, located along the Yarra River, also dished up a delicious dessert – a toasted meringue raspberry bombe with umushu caramel and broken raspberries. We ended the day with ox cheek braised in root beer with carrots, ginger and sesame by St Kilda's longtime Circa (awarded 2 Chef's Hats this year - top right photo.). How about some crunchy tostada bites from the Mexican restaurant, El Cielo? 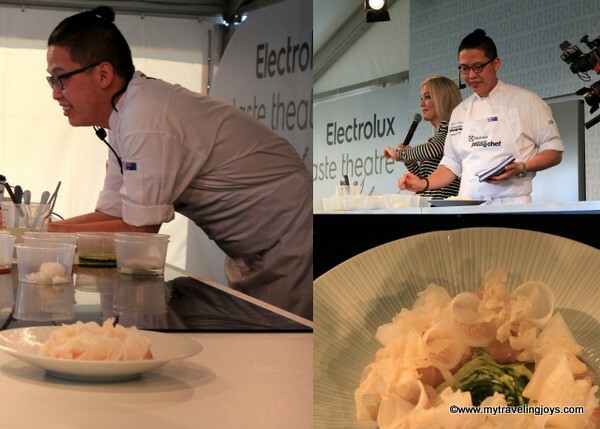 In addition to sampling some of the best of Melbourne's eateries, local chefs gave several live cooking demonstrations at the Electrolux Taste Theatre. We watched Chef Victor Liong of Lee Ho Fook prepare Kingfish sashimi with radishes and burnt garlic and ginger soy cream. This looks like another restaurant that we need to try here. Just being silly at the Taste of Melbourne festival! Looks like you and Jason had a great time. The food looks amazing..Glad you are having fun in the sun. @Adam, Wow! Even my own brother is commenting now! ;) I know we all would've had a good time. @Annie, yes, we were quite glutinous that day!